Do you know your people as well as you know your customers? Your people’s expectations and the way they work is changing. Employees are more diverse, mobile and technologically-savvy than ever before. HR processes are changing from focusing on transactions to knowing and engaging people. Just as sales and marketing teams use data to develop actionable and informed insights about their customers, you need to do the same in HR to know your people. Everything, from attracting and keeping the best talent, to creating better workplace experiences and increasing employee engagement and productivity, depends on smarter decisions. These in turn rely on more actionable insights. These are only possible through accurate HR data and analytics. They are vital to address the people challenges you face, so you can make smarter decisions. 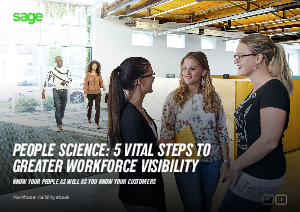 Discover in this guide how to improve visibility of your workforce with data-driven and actionable insights. Ultimately, it will help you know your people better and drive your business growth.